PEMBROKE PINES, February 19, 2018–With the championship season right around the corner, South Florida Aquatic Club swimmers are more than ready for March Madness. Swimmers got in one final weekend of solid racing against a good field of Florida Gold Coast swimmers at this past weekend’s Gulliver Winter Invitational at their home Academic Village Pool. Several SOFLO swimmers are preparing for the March 3-4 Area 3 Championships at SOFLO, March 8-11 Speedo Southern Zone Sectionals at Plantation, March 16-18 Junior Olympics at Coral Springs and March 22-25 Senior Championships at SOFLO. SOFLO had the largest contingent of 90 (45 girls and 45 boys) swimmers competing in 484 individual events and most of them had at least one best time. Fiorella Di Salvo, 50-yard breaststroke, 42.10. Valerie Vank, 50-yard breaststroke, 32.46, best time; 100-yard butterfly, 1:03.91, best time; 100-yard individual medley, 1:03.88, best time; 100-yard breaststroke, 1:10.49; 50-yard butterfly, 29.06, best time. Hartley Pitters-Hinds, 50-yard freestyle, 27.82. Alexis Christensen, 100-yard freestyle, 59.10, best time. Christian Tijero, 200-yard freestle, 2:04.80. Alejandro Mateus, 100-yard backstroke, 1:03.99; 50-yard breaststroke, 35.66, best time; 50-yard freestyle, 26.33, best time; 100-yard butterfly, 1:02.46; 100-yard individual medley, 1:03.84, best time; 100-yard freestyle, 56.11, best time; 50-yard butterfly, 27.64, best time; 50-yard backstroke, 29.51, best time. Alessandro Pereira, 100-yard breaststroke, 1:15.02, best time. SOFLO’s Moises Rodriguez, 13, was third in the 400-yard individual medley in a lifetime-best 4:44.71, shaving 16.27 seconds off his previous best. In addition to SOFLO and Gulliver, other teams competing wereKids Sharks, Metro Aquatics and Miami Country Day Aquatics. 1. Mary Smutny, AquaKids Sharks 17:11.47; SOFLO: 8. Sara Quintero 18:49.38, 12. Victoria Torres 19:57.38, 13. Sofia Osorio 19:57.83, 14. Sabrina Osorio 20:16.62, 16. Leah Pando 20:50.65. 10-and-under, 1. Sofia Moreno, Gulliver 2:17.49; SOFLO: 2. Mariana Pinto 2:20.87, 3. Giada Porven 2:22.51, 6. Fiorella Di Salvo 2:27.03, 14. Isabella Perry 3:02.20; 11-12, 1. Paola Gonzalez, Metro Aquatics 2:04.88; SOFLO: 2. Alexis Christensen 2:05.55, time drop, 3. Kerry Cunningham 2:13.55, time drop, , 6. Ava Kuznik 2:16.93, time drop, 7. Leah Pando 2:18.95, time drop, 8. Reagan Lowe 2:19.87, time drop, 10. Hartley Pitters-Hinds 2:20.06, 11. Luna Delgado 2:20.21, 15. Anastasia Lutz 2:22.61, time drop; 13-and-over, 1. Alicia Mancilla, Gulliver 1:58.63; SOFLO: 16. Rebekah Ling 2:07.11. 13-and-over, 1. Gaby Antonini, Gulliver 2:09.07; SOFLO: 12. Rebekah Ling 2:22.35, 15. Sofia Osorio 2:24.07. 10-and-under, 1. Sofia Moreno, Gulliver 1:12.80; SOFLO: 2. Fiorella DiSalvo 1:16.61, 5. Abigail-Marie Natino 1:22.26, time drop, 16. Samira Borges 1:36.90; 11-12, 1. Paola Gonzalez, Metro Aquatics 1:07.95; SOFLO: 2. Alexis Christensen 1:08.65, 3. Natalia Sibug 1:12.92, time drop, 5. Reagan Lowe 1:13.70, time drop, 10. Judith-Alison Natino 1:18.73. 13-and-over, 1. Evita Leter, Metro Aquatics 1:07.71; SOFLO: 9. Sabrina Osorio 1:14.81, time drop, 10. Daniela Curbelo 1:15.85, 15. Mia Escudero 1:18.96, 18. Kalin Hubbard 1:20.71. 10-and-under, 1. Fiorella Di Salvo, SOFLO 42.10; SOFLO: 5. Mariana Pinto 43.05, 9. Sarah Vasquez 44.53, 10. Abigail-Marie Natino 44.64, 12. Savini Subasingha 46.47, 14. Shelby Evans 47.72, time drop, 15. Caterina Fogli 47.82; 11-12, 1. Valerie Vank, SOFLO 32.46, time drop; SOFLO: 3. Natalia Sibug 35.61, time drop, 5. Kaitlyn Barrios 36.86, time drop, 7. Mariann Catalasan 37.65, time drop, 8. Anastasia Lutz 39.14, time drop, 12. Luna Delgado 39.97, time drop, 14. Kerry Cunningham 40.97. 10-and-under, 1. Sofia Moreno, Gulliver 29.59; SOFLO: 4. Giada Porven 31.07, 5. Mariana Pinto 31.15, time drop, 6. Fiorella Di Salvo 31.17, time drop, 7. Sarah Vasquez 33.17, 11. Abigail-Marie Natino 34.08, time drop, 14. Caterina Fogli 34.54; 11-12, 1. Hartley Pitters-Hinds, SOFLO 27.82, time drop; SOFLO: 2. Anastasia Lutz 28.08, time drop, 4. Reagan Lowe 29.03, time drop, 5. Kaitlyn Barrios 29.04, 11. Natalia Sibug 29.95, 13. Luna Delgado 30.12, 14. Kerry Cunningham 30.13, time drop; 13-and-over, 1. Evita Leter, Metro Aquatics 25.45; SOFLO: 18. Rebekah Ling 26.94, time drop. 13-and-over, 1. Emily Cordovi, Gulliver 2:03.80; SOFLO: 9. Sara Quintero 2:18.46, time drop. 10-and-under, 1. Sofia Moreno, Gulliver 1:10.93; SOFLO: 4. Mariana Pinto 1:29.84, 8. Savina Subasingha 1:49.10; 11-12, 1. Valerie Vank, SOFLO 1:03.91, time drop; SOFLO: 2. Luna Delgado 1:08.69, 6. Alexis Christensen 1:14.50, time drop, 10. Anastasia Lutz 1:20.95. 13-and-over, 1. Alicia Mancilla, Gulliver 5:11.05; SOFLO: 18. Victoria Torres 5:48.55, time drop, 20. Daniela Curbelo 5:49.47, 22. Kailey Smith 6:05.41, time drop. 13-and-over, 1. Olivia Dinehart, AquaKids Sharks 2:12.90; SOFLO: 20. Kalin Hubbard 2:32.39. 10-and-under, 1. Sofia Moreno, Gulliver 1:12.19; SOFLO: 2. Giada Porven 1:18.12, 3. Mariana Pinto 1:18.81, time drop, 6. Abigail-Marie Natino 1:24.66, time drop, 8. Savini Subasingha 1:26.38, time drop, 13. Francesca Perry 1:35.86, time drop, 14. Isabella Perry 1:37.20, 15. Samira Borges 1:38.38, 16. Shelby Evans 1:39.98; 11-12, 1. Valerie Vank, SOFLO 1:03.88, time drop; SOFLO: 2. Alexis Christensen 1:10.84, 3. Kaitlyn Barrios 1:11.44, time drop, 6. Natalia Sibug 1:13.34, time drop, 7. Luna Delgado 1:14.08, time drop, 10. Anastasia Lutz 1:14.65, time drop, 11. Reagan Lowe 1:14.66, time drop, 12. Hartley Pitters-Hinds 1:14.70, 15. Leah Pando 1:15.29, time drop. 10-and-under, 1. Sofia Moreno, Gulliver 1:04.52; SOFLO: 3. Mariana Pinto 1:07.42, 4. Fiorella Di Salvo 1:08.60, 5. Sarah Vasquez 1:11.02, time drop, 6. Savini Subasingha 1:15.45, time drop, 8. Abigail-Marie Natino 1:16.88, time drop, 10. Caterina Fogli 1:20.18, 12. Isabella Perry 1:24.79, time drop, 13. Samira Borges 1:27.32; 11-12, 1. Alexis Christensen, SOFLO 59.10, time drop; SOFLO: 2. Kaitlyn Barrios 1:02.32, 5. Luna Delgado 1:03.87, 8. Natalia Sibug 1:05.53, 9. Leah Pando 1:05.99, time drop, 12. Mariann Catalasan 1:07.28, time drop, 14. Judith-Alison Natino 1:07.98, time drop, 20. Anastasia Lutz 1:20.69; 13-and-over, 1. Emily Cordovi, Gulliver 52.19; SOFLO: 13. Rebekah Ling 57.69, time drop, 22. Daniela Curbelo 59.32. 13-and-over, 1. Olivia Hernandez, Gulliver 2:30.12; SOFLO: 8. Mia Escudero 2:46.90, 17. Valeria Garcia 3:13.27. 10-and-under, 1. Olivia Quintane, Metro Dade 1:58.25; 11-12, 1. Valerie Vank, SOFLO 1:10.49; SOFLO: 2. Natalia Sibug 1:20.35, time drop, 5. Kaitlyn Barrios 1:21.92, time drop, 8. Leah Pando 1:25.37, 9. Alexis Christensen 1:25.76. 13-and-over, 1. Emily Cordovi, Gulliver 55.53; SOFLO: 21. Sofia Osorio 1:10.74, 23. Kalin Hubbard 1:1085, time drop, 24. Mia Escudero 1:11.01, 25. Victoria Torres 1:13.84, 26. Sabrina Osorio 1:13.89, time drop, 27. Kailey Smith 1:14.03. 10-and-under, 1. Sofia Moreno, Gulliver 31.62; SOFLO: 2. Fiorella Di Salvo 35.70, time drop, 6. Mariana Pinto 37.60, 7. Sarah Vasquez 38.01, time drop, 9. Abigail-Marie Natino 39.62, time drop, 12. Sofia Subasingha 42.22, 13. Caterina Fogli 42.97, 15. Isabella Perry 45.11, 16. Francesca Perry 46.04, time drop; 11-12, 1. Valerie Vank, SOFLO 29.06, time drop; SOFLO: 3. Luna Delgado 32.04, 6. Reagan Lowe 33.29, time drop, 10. Hartley Pitters-Hinds 33.79, 11. Anastasia Lutz 33.89, time drop. 13-and-over, 1. Emily Cordovi, Gulliver 58.09; SOFLO: 10. Rebekah Ling 1:06.31, 15. Sofia Osorio 1:07.98. 10-and-under, 1. Sofia Moreno, Gulliver 33.69; SOFLO: 2. Giada Porven 35.80, time drop, 4. Fiorella Di Salvo 36.15, time drop, 5. Abigail-Marie Natino 37.90, time drop, 8. Sarah Vasuez 40.70, 14. Caterina Fogli 42.28, 15. Isabella Perry 43.17, time drop, 16. Francesca Perry 45.00, time drop; 11-12, 1. Giovanna Musiello, Gulliver 32.22; SOFLO: 2. Alexis Christensen 33.12, 4. Reagan Lowe 33.93, time drop, 6. Natalia Sibug 34.38, time drop, 7. Leah Pando 34.66, time drop, 8. Anastasia Lutz 34.84, 11. Luna Delgado 35.41, time drop, 14. Judith-Allison Natino 36.49, time drop. 13-and-over, 1. Olivia Dinehart, AquaKids Sharks 4:40.72; SOFLO: 2. Daniela Curbelo 4:55.25, 13. Victoria Torres 5:19.04, time drop. 1. Miguel Cancel, AquaKids Sharks 16:10.34; SOFLO: 6. Enrique Rldriguez 18:35.79, 7. Zackary Harris 18:43.30, 9. Christopher Hau 18:57.39, 10. Christian Tijero 18:59.75, 12. Logan Gonzalez 19:52.84, time drop, 13. Chris Vasquez 19:55.88. 10-and-under, 1. Carlos Morlote, Gulliver 2:24.12; SOFLO: 6. Juan Vallmitjana 2:49.30, 8. Jason Moya 3:37.37, time drop; 11-12, 1. Christian Tijero, SOFLO 2:04.80; SOFLO: 2. Alessandro Pereira 2:07.09, 3. Lucas Porven 2:10.07, 4. Diego Nazario-Vazquez 2:14.15, 11. Gavin Sheyda 2:23.73, 13. Hashan Ekanayake 2:26.17, 15. Marvan Ekanayake 2:29.09, time drop, 16. Owen Smith 2:29.63; 13-and-over, 1. Brandon Vives, Metro Aquatics 1:43.68. 13-and-over, 1. Aitor Fungairino, Metro Aquatics 1:52.64; SOFLO: 12. Yannai Michael 2:15.24, time drop, 16. Mark Andre De Gracia 2;18.68, time drop, 18. Alex Golding 2:19.46, 19. Matthew Kim 2:23.66. 10-and-under, 1. George Gonzalez, Metro Aquatics 1:09.96; SOFLO: 3. Benjamin Kim 1:23.11, 11. Jason Moya 1:48.86; 11-12, 1. Alejandro Mateus, SOFLO 1:03.99; SOFLO: 2. Aldo Zepeda 1:06.23, time drop, 3. Alessandro Pereira 1:07.60, time drop, 9. Marvan Ekanayake 1:19.94, 10. Hashan Ekanayake 1:20.01, 12. Kevin Moya 1:20.69, time drop, 14. Owen Smith 1:21.87, 15. Gavin Sheyda 1:21.89, 17. Rick Esser 1:31.05, time drop. 13-and-over, 1. Teo Darias, Gulliver 59.65; SOFLO: 11. Javier Roman 1:05.87, 19. Yannai Michael 1:07.99, 23. Samuel Bullen 1:10.14, time drop, 24. Mark Andre De Gracia 1:10.69, time drop, 27. Logan Gonzalez 1:11.76, time drop. 10-and-under, 1. George Gonzalez, Metro Aquatics 33.61; SOFLO: 4. Benjamin Kim 42.97, 5. Stefano Mazzi 44.02, time drop, 6. Joseph-Blake Natino 44.25, time drop, 8. Juan Vallmitjana 49.42, time drop, 13. Martin Petkov 54.11; 11-12, 1. Alejandro Mateus, SOFLO 35.66, time drop; SOFLO: 2. Aldo Zepeda 38.08, time drop, 9. Kevin Moya 42.46, time drop, 10. Owen Smith 44.22, time drop, 11. Gavin Sheyda 44.68, 14. Hashan Ekanayake 47.04, 19. Colin Gregory 1:01.39, time drop. 10-and-under, 1. George Gonzalez, Metro Aquatics 28.41; SOFLO: 4. Stefano Mazzi 32.87, time drop, 5. Benjamin Kim 33.54, 6. Juan Vallmitjana 33.64, 11. Joseph-Blake Natino 36.90, 12. Preston Feldman 38.29; 11-12, 1. Alejandro Mateus, SOFLO 26.33, time drop; SOFLO: 3. Christian Tijero 27.16, time drop, 5. Diego Nazario-Vazquez 27.99, time drop, 10. Kevin Moya 29.14, time drop, 16. Owen Smith 31.91, 17. Hashan Ekanayake 31.94, 18. Marvan Ekanayake 32.43, 19. Alessio Mazzi 33.38, time drop; 13-and-over, 1. Irvin Hoost, Metro Aquatics 21.56; SOFLO: 13. Casey Moya 23.91. 13-and-over, 1. Brandon Vives, Metro Aquatics 1:54.71. 10-and-under, 1. George Gonzalez, Metro Aquatics 1:10.08; SOFLO: 7. Benjamin Kim 1:30.74, 8. Stefano Mazzi 1:31.28; 11-12, 1. Alejandro Mateus, SOFLO 1:02.46; SOFLO: 2. Christian Tijero 1:03.55, time drop, 3. Lucas Porven 1:05.00, time drop, 4. Aldo Zepeda 1:07.25, 5. Diego Nazario-Vazquez 1:10.99, 12. Gavin Sheyda 1:19.87, time drop, 13. Marvan Ekanayake 1:20.66, 14. Erick Esser 1:49.29. 13-and-over, 1. Gregory Espinoza, Metro Aquatics 4:50.00; SOFLO: 10. Javier Roman 5:10.64. 13-and-over, 1. Jonathan Rodriguez, Gulliver 2:02.25; SOFLO: 5. Javier Roman 2:09.53, 11. Zackary Harris 2:16.47, time drop, 15. Moises Rodriguez 2:17.78, time drop, 18. Mark Andre De Gracia 2:18.78, time drop, 22. Logan Gonzalez 2:21.70, time drop. 10-and-under, 1. Joshua Barreto, OSC 1:16.48; SOFLO: 2. Stefano Mazzi 1:20.86, 4. Joseph-Blake Natino 1:28.93, time drop, 5. Juan Vallmitjana 1:32.36, time drop, 11. Martin Petkov 1:42.92, time drop, 16. Jason Moya 1:54.13, time drop; 11-12, 1. Alejandro Mateus, SOFLO 1:03.84, time drop; SOFLO: 3. Christian Tijero 1:06.84, time drop, 4. Alessandro Pereira 1:07.56, 5. Aldo Zepeda 1:08.90, time drop, 7. Diego Nazario-Vazquez 1:13.02, time drop, 12. Owen Smith 1:19.43, time drop, 13. Kevin Moya 1:19.49, time drop, 14. Marvan Ekanayake 1:21.12, time drop, 15. Hashan Ekanayake 1:22.67, time drop. 10-and-under, 1. Max Segal, Miami Dade 43.41; SOFLO: 3. Stefano Mazzi 1:11.59, time drop, 4. Benjamin Kim 1:13.97, tie drop, 5. Juan Vallmitjana 1:15.20, time drop, 6. Alex Viazmetinov 1:15.24, time drop, 8. Leo Shee 1:20.59; 11-12, 1. Alejandro Mateus, SOFLO 56.11, time drop; SOFLO: 3. Aldo Zepeda 1:00.60, time drop, 5. Diego Nazario-Vazquez 1:02.23, time drop, 10. Gavin Sheyda 1:07.58, time drop, 11. Hashan Ekanayake 1:07.71, 12. Kevin Moya 1:07.76, 13. Marvan Ekanayake 1:09.07, time drop, 14. Owen Smith 1:09.09, time drop; 13-and-over, 1. Kyle Korvick, Gulliver 49.58; SOFLO: 14. Enrique Rodriguez 54.72, 17. Yannai Michael 54.98, time drop, 20. Chris Vasquez 55.68, 21. Zackary Harris 56.09, time drop, 22. Anthony Robaina 56.46. 13-and-over, 1. Teo Darias, Gulliver 2:13.88; SOFLO: 5. Javier Roman 2:21.47, 7. Yannai Michael 2:21.81, time drop, 11. Samuel Bullen 2:32.94, time drop, 12. Logan Gonzalez 2:32.95, time drop. 10-and-under, 1. Joshua Barreto, OSC 1:26.00; SOFLO: 2. Benjamin Kim 1:32.03, 3. Joseph-Blake Natino 1:34.91, time drop, 5. Leo Shee 1:45.47, 7. Martin Petkov 1:49.14, time drop; 11-12, 1. Alessandro Pereira, SOFLO 1:15.02, time drop; SOFLO: 2. Christian Tijero 1:16.97, time drop, 3. Lucas Porven 1:18.76, time drop, 6. Aldo Zepeda 1:22.62, time drop. 13-and-over, 1. Nikita Efimov, OSC 55.92; SOFLO: 9. Marcos Vazquez 1:00.99, 13. Moises Rodriguez 1:01.59, 16. Yannai Michael 1:01.93, time drop, 17. Chris Vasquez 1:02.17. 10-and-under, 1. Joshua Barreto, OSC 33.51; SOFLO: 2. Stefano Mazzi 37.18, time drop, 4. Benjamin Kim 39.87, 6. Juan Vallmitjana 41.53, 7. Joseph-Blake Natino 45.50, 9. Alex Viazmetinov 46.16; 11-12, 1. Alejandro Mateus, SOFLO 27.64, time drop; SOFLO: 2. Christian Tijero 29.41, time drop, 4. Diego Nazario-Vazquez 32.50, 7. Marvan Ekanayake 34.05, time drop, 8. Owen Smith 34.15, time drop, 9. Gavin Sheyda 34.34. 13-and-over, 1. Kyle Korvick, Gulliver 57.10; SOFLO: 6. Enrique Rodriguez 1:01.49, time drop, 8. Zackary Harris 1:02.84, time drop, 13. Marcos Vazuez 1:06.07, 15. Logan Gonzalez 1:06.55. 10-and-under, 1. Joshua Barreto, OSC 38.77; SOFLO: 2. Benjamin Kim 40.09, 3. Leo Shee 42.59, 4. Alex Viazmetinov 42.80, 5. Preston Feldman 44.69, 6. Joseph-Blake Natino 44.91; 11-12, 1. Alejandro Mateus 29.51, time drop; SOFLO: 2. Aldo Zepeda 30.92, time drop, 3. Alessandro Pereira, 32.52, 5. Lucas Porven 33.29, time drop, 7. Marvan Ekanayake 35.95, 10. Hashan Ekanayake 37.23, 11. Kevin Moya 37.62, 12. Gavin Sheyda 37.80, time drop. 13-and-over, 1. Jake Wienants, Gulliver 4:32.55; SOFLO: 3. Moises Rodriguez 4:44.27, time drop. PEMBROKE PINES, February 15, 2018–South Florida Aquatic Club swimmers will get the chance to compete in their home pool against a strong field today through Sunday in the Gulliver Winter Invitational. SOFLO heads the field with the largest contingent of 90 (45 girls and 45 boys) swimmers competing in 484 individual events at Academic Village Pool. Christian Tijero, 12, 200-yard freestyle, 2:02.49. Alexis Christensen, 12, 100-yard backstroke, 1:07.26; 200-yard freestyle, 2:07.13; 100-yard freestyle, 1:00.30. Alejandro Mateus, 12, 100-yard backstroke, 1:02.35; 50-yard freestyle, 26.52; 100-yard butterfly, 1:01.56; 100-yard freestyle, 57.19; 50-yard butterfly, 28.55; 50-yard backstroke, 29.72. Valerie Vank, 12, 50-yard breaststroke, 32.48; 100-yard butterfly, 1:08.10; 100-yard individual medley, 1:09.54; 100-yard breaststroke, 1:10.65. Hartley Pitters-Hinds, 12, 50-yard freestyle, 27.96; 50-yard backstroke, 32.58. Daniela Curbelo, 15, 400-yard individual medley, 4:44.18. Alessandro Pereira, 11, 100-yard breaststroke, 1:15.28. Also in the field are top seeds Miguel Cancel of AquaKids Sharks, Marcella Ruppert-Gomez, Alicia Mancilla, Emily Cordovi and Gaby Antonini of Gulliver Swim Club, Aitor Fungairino, Irvin Hoost, Brandon Vives and Evita Leter of Metro Aquatics. In addition to SOFLO and Gulliver, other teams competing are AquaKids Sharks, Metro Aquatics and Miami Country Day Aquatics. The girls and boys 1,650-yard freestyle is Friday beginning at 5 p.m. Miguel Cancel, 18, of AquaKids Sharks and Marcella Ruppert-Gomez of Gulliver are top seeds. The bulk of the events are Saturday and Sunday beginning at 9 a.m. The 13-and-under and 12-and-under sessions have been combined for both days. Schedule: Friday, 5-6:30 p.m.; Saturday, 9 a.m.-1:30 p.m.; Sunday, 9 a.m.-12:30 p.m.
Of note: The 13-and-over and 12-and-under have been combined on Saturday and Sunday. Gulliver Swim Team will host the meet at SOFLO’s home pool. Admission is $6 per session. Heat sheets will be posted online. PARKLAND, February 15, 2018—-The swimming community is saddened beyond belief by the senseless death of Nicholas Dworet. The swimmer was one of 17 killed during one of the nation’s deadliest school shootings Wednesday at his beloved high school, Marjory Stoneman Douglas. 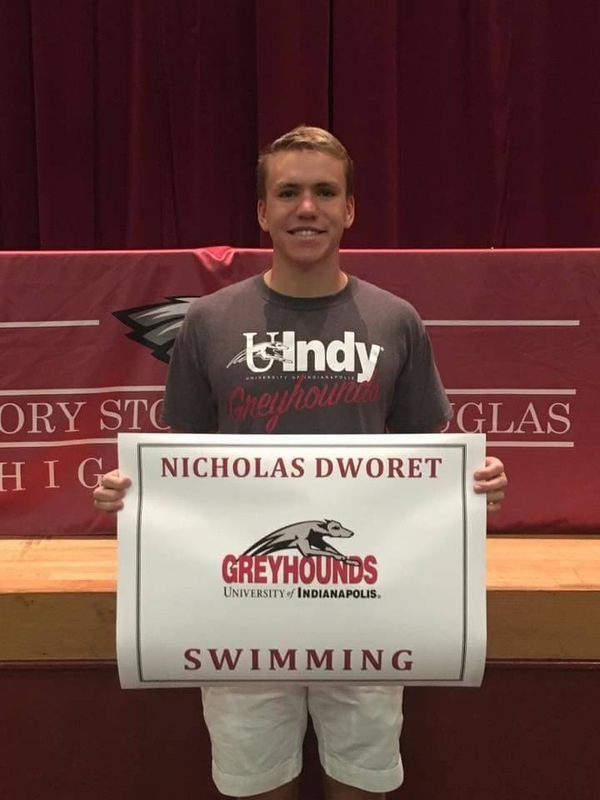 Dworet, 17, a high school and club swimmer in the Florida Gold Coast and water polo player, was headed to the University of Indianapolis on an academic scholarship this fall. The program is ranked in the top five of NCAA Division II swimming. Dworet was a member of TS Aquatics and before that Coral Springs Swim Club. Dworet earned second team All-County honors in the freestyle and consistently ranked among the county’s top swimmers in the honor roll. In the past 18 months since he joined TS Aquatics, he turned his life around for the better. He focused on his academics and training and improved from a middle-of-the-pack swimmer according to TS Aquatics Coach Andre Bailey. Dworet found purpose and focus and was ready to start the next chapter of his academic and swimming career, Bailey said. Bailey said he was making all the right choices. Dworet of Swedish descent, had even hoped to earn a spot on the Swedish national swim team in the future. Dworet was team captain on TS Aquatics and known as “swim daddy.” He took the younger swimmers under his wing and helped to motivate them at practice. Bailey was with Dworet’s family when they got the notification of his death Thursday morning. He was one of the first victims to be identified after his family shared his photo on social media. “Nicholas was a happy young man who embodied the values of our program,” TS Aquatics posted. “He was an amazing person as well as a great swimmer. A young man who had changed his life recently and was on a major upswing in his life. Swimmers, coaches and friends have been sharing their condolences on social media around the U.S.
At St. Thomas Aquinas High School during Thursday morning prayer service, 17 white balloons were released in honor of those who lost their lives. UIndy President Robert L. Manuel and swim coach Jason Hite have been in contact with the Dworet family and will continue to offer support. “Nick’s death is a reminder that we are connected to the larger world, and when tragedy hits in places around the world, it often times affects us at home,” Manuel said in a statement emailed to the Indianapolis Star. “Nick was a great kid. A long-time teammate of our children and an all-around great kid from a great family. We are at a loss for words right now. Our son always looked up to Nick at Coral Springs and also TS Aquatics. Kiddo you will be missed, such a devastating senseless loss. So many friends and families in this community are devastated. A Go Fund Me page has been started. The Stoneman Douglas Victims’ Fund has already raised $382,841 (by 6,790 people in six hours) of the $450,000 goal that will be used to provide relief and financial support to the victims and families. February 14, 2018—South Florida Aquatic Club swimmers were among top finishers against a strong field of teams at the Florida Gold Coast Senior Long Course Sectional Qualifier at Plantation Aquatic Complex this past weekend. Kathleen Golding, 17, won two individual events and one relay, and picked up second, third, fourth and seventh places. She finished with 85 points in high point. Golding won the 200-meter freestyle in 2:07.18 and 100-meter freestyle in 59.84; was second in the 100-meter butterfly in 1:06.10; third in the 400-meter freestyle in 4:29.19; and seventh in the 200-meter backstroke in 2:33.55, with a time drop of 0.87. Mallory Schleicher, 14, took first, fourth, seventh and eighth places in the meet and finished with 47 points in high point. After dropping 19.64 seconds in the 800-meter freestyle in 9:27.32 to open the meet, Schleicher, off to a great start this year in both open water and pool swimming, won the 1500-meter freestyle in 18:04.44, dropping 14.73 seconds. She was seventh in the 200-meter freestyle 2:14.97 and fourth in the 400-meter freestyle in 4:34.30, dropping 6.89 seconds. Kelley Heron, 18, finished with 50 points in high point with two seconds, one third and one fourth place. She was second in the 200-meter individual medley in 2:31.30; second in the 50-meter backstroke in 32.35; and fourth in the 200-meter backstroke in 2:26.78. Molly Golding, 14, finished with 47 points in high point with one second, one third and two fourth places. She was second in the 200-meter breaststroke in 2:48.01; fourth in the 400-meter individual medley in 5:23.11; and fourth in the 100-meter backstroke in 1:19.67. Gaby Banks, 15, was fifth in the 50-meter freestyle in 28.09 and finished with 24 points. Rafael Rodriguez, 16, was SOFLO’s highest point finisher among boys with 74.5 points. He was second in the 400-meter freestyle in 4:20.24; second in the 200-meter butterfly in 2:13.91 with a time drop of 1.16 and fourth in the 200-meter individual medley in 2:16.63. In one of the more exciting women’s races, Andrea Santander of Pine Crest Swimming was pushed to the limit by Heron in the 50-meter backstroke, 32.33-32.35. It was a lifetime best time for Santander, who represents Venezula internationally. In another exciting race, this time the men’s 100-meter breaststroke, Victor Fajer of Azura edged Juan Pablo Pineda, 1:10.43-1:10.49. SOFLO’s “A” relay of Juan Serna, Kathleen Golding, Paige Lane and Kevin Porto won the 200-meter freestyle relay in 1:48.77. Azura Florida Aquatics, with a large group of age 20-plus swimmers, won the boys team title with 497.5 points. South Florida Aquatic Club was second with 295. Pine Crest Swimming won the girls team title with 426.5 points. North Palm Beach Swim Club was second with 318 and SOFLO girls were third with 313. MEN: 1. Azura Florida Aquatics 497.5, 2. South Florida Aquatic Club 295, 3. Pine Crest 228, 4. TS Aquatics 210, 5. St. Andrew’s 193, 6. East Coast Aquatic Club 107, 7. Swim Fort Lauderdale 104, 8. North Palm Beach 86, 9. PAQ 78, 10. Boca Raton Swim Team 55. WOMEN: 1. Pine Crest Swim Team 426.5, 2. North Palm Beach 318,3. South Florida Aquatic Club 313, 4. East Coast Aquatic Club 305.5, 5. Azura 240, 6. St. Andrew’s 155, 7. Swim Fort Lauderdake 127, 8. AquaKids Sharks 111.5, 9. TS Aquatics 70, 10. Eagle Aquatics 36, 21. Boca Raton Swim Team 4. Mixed 200-meter medley relay: 1. St. Andrew’s A 1:58.41; 3. SOFLO C (Juan Diaz, Molly Golding, Katrina Del Vecchio, Heath Brames), 2:06.21, 4. SOFLO B (Bryan Rivero, Jennifer Rodriguez, Paige Lane, Juan Serna) 2:08.14. 1. SOFLO A 1:48.77 (Juan Serna, Kathleen Golding, Paige Lane, Kevin Porto), 2. St. Andrew’s 1:50.23, 3. SOFLO B 1:51.70, 4. SOFLO C 1:51.82, 7. SOFLO D 1:56.22. 200-meter freestyle: 1. Kathleen Golding, SOFLO 2:07.18; SOFLO: 7. Mallory Schleicher 2:14.97, 15. Paige Lane 2:17.92, 17. Gaby Banks 2:19.11. 1. Alessandra Baldari, NPB 2:29.21; SOFLO: 2. Kelley Heron 2:31.30, 11. Jennifer Rodriguez 2:42.32,14. Jacqueline Lugo 2:43.17, 16. Katrina Del Vecchio 2:44.37. 1. Alessandra Baldari, NPB 5:01.08; SOFLO: 4. Molly Golding 5:23.11. 1. Mary Smutny, AquaKids Sharks 2:24.01; SOFLO: 9. Sara Quintero 2:41.89, 12. Paige Lane 2:44.07. 1. Cathy Cooper, SFTL 26.97; SOFLO: 5. Gaby Banks 28.09, 18. Katrina Del Vecchio 29.17, 24. Kelley Heron 29.53, 26. Jacqueline Lugo 29.72. 1. Kathleen Golding, SOFLO 59.84; SOFLO: 12. Gaby Banks 1:02.93, 20. Molly Golding 1:04.62, time drop, 22. Jacqueline Lugo 1:05.04, 28. Maya Coffey 1:05.83. 1. Mary Smutny, AquaKids Sharks 4:28.70; SOFLO: 3. Kathleen Golding 4:29.19, 4. Mallory Schleicher 4:34.30, time drop, 13. Paige Lane 4:49.56. 1. Mallory Schleicher, SOFLO 18:04.44, time drop. 1. Andrea Santander, PC 2:24.11; SOFLO: 4. Kelley Heron 2:26.78, 7. Kathleen Golding 2:33.55, time drop, 19. Sara Quintero 2:44.12. 1. Patricia Casella, Azura 1:17.34; SOFLO: 4. Molly Golding 1:19.67, 13. Jennifer Rodriguez 1:22.73, 27. Valentin Carrion 1:31.86. 1. Patricia Casellas, Azura 2:47.88; SOFLO: 2. Molly Golding 2:48.01, 9. Jennifer Rodriguez 3:03.26. 1. Andrea Santander, PC 29.46; SOFLO: 9. Paige Lane 30.88, 12. Gaby Banks 31.26, 13. Katrina Del Vecchio 31.59, 17. Jacqueline Lugo 32.06, 25. Kyana Castro 33.00, 32. Maya Coffey 33.52, 33. Jennifer Rodriguez 33.62. 1. Mary Smutny, AquaKids Sharks 1:05.08; SOFLO: 2. Kathleen Golding 1:06.10, 10. Paige Lane 1:09.85, 13. Jacqueline Lugo 1:11.10, 16. Kelley Heron 1:11.80, 18. Katrina Del Vecchio 1:12.39, 19. Gaby Banks 1:12.98. 1. Andrea Santander, Pine Crest 32.33; SOFLO: 2. Kelley Heron 32.35. 1. Giulia Guerra Montes, Pine Crest 1:07.88; SOFLO: 24. Sara Quintero 1:18.51. 1. Patricia Casellas, Azura 35.14; SOFLO: 20. Sara Quintero 42.52., 30. Ruth Kauffman 46.15. 1. Daniel Torres, Azura 1:59.04; SOFLO: 7. Rafael Rodriguez 2:01.83, 15. CJ Kopecki 2:07.34, 16. Heath Bames 2:07.46, 23. Leonardo Mateus 2:09.83. 1. Joaquin Vargas Gallo, Unattached 4:11.11; SOFLO: 2. Rafael Rodriguez 4:20.24, 12. Leonardo Mateus 4:30.05, 13. Ricardo Roche 4:31.22, 17. Heath Brames 4:37.73, 18. Luis Villanueva 4:38.07. 1. Andres Lares, Azura 16:49.23. 1. Miguel Cancel, Unattached 2:11.70; SOFLO: 4. Rafael Rodrigiez 2:16.63, 8. Ricardo Rcohe 2:22.88, 9. Leonardo Mateus 2:24.00, 15. Joseph Lee 2:27.30, 21. John Paul Handal 2:29.61. 1. Miguel Cancel, Unattached 4:40.16; SOFLO: 8. Leonardo Mateus 5:07.86, 10. Joseph Lee 5:12.54, 11. John Paul Handal 5:13.23, time drop, 16. Alejandro Mateus 5:36.39. 1. Carlos Vasquez, TSA 2:11.73; SOFLO: 2. Rafael Rodriguez 2:13.91, time drop, 7. CJ Kopecki 2:21.06, 8. Luis Villanueva 2:22.94, 12. John Paul Handal 2:29.79. 1. Luis Flores, Azura 23.54; SOFLO: 5. Luke Lezotte 24.63, 12. Juan Serna 25.71, 22. Heath Brames 26.53, 23. Juan Diaz 26.68, 25. Kevin Porto 26.81. 1. Luis Flores, Azura 52.13; SOFLO: 14. Luke Lezotte 57.72, 18. Juan Serna 58.35, 20. Juan Pablo Pineda 58.78. 1. Miguel Cancel, Unattached 2:11.10; SOFLO: 10. Leonardo Mateus 2:24.22, 12. Bryan Rivero 2:25.79, 15. Nicolas Munoz 2:29.96, 17.Moises Rodriguez 2:30.56, 18. Juan Diaz 2:32.65. 1. Brandon Moran, Unattached 32.27. 1. Victor Fajer, Azura 1:10.43; SOFLO: 2. Juan Pablo Pineda 1:10.49, 11. Joseph Lee 1:16.25, 15. Luis Villanueva 1:18.82. 1. Brandon Moran, Unattached 2:32.30; SOFLO: 13. Joseph Lee 2:49.27. 1. Edson Lima, Azura 25.70; SOFLO: 6. Luke Lezotte 26.52, 12. Juan Serna 27.49, 23. CJ Kopecki 28.83, 25. John Paul Handal 29.11, time drop. 1. Edson Lima, Azura 56.91; SOFLO: 13. Luis Villanueva 1:03.21, 19. Juan Serna 1:05.68, 20. Heath Brames 1:05.95, 23. John Paul Handal 1:06.96. 1. Daniel Torres, Azura 27.31; SOFLO: 6. Luke Lezotte 29.95, 12. Nicolas Munoz 32.64, 15. Moises Rodriguez 33.82, 17. Alejandro Mateus 34.82. 1. Daniel Torres, Azura 1:00.67; SOFLO: 19. Moises Rodriguez 1:12.58. WESTON, February 12, 2018—South Florida Aquatic Club swimmers had fun and swam well at the 8&Under YSF Barracudas Sizzler Friday at YMCA Family Center. Jordan Evans, 6, led the girls and Connor Jimenez, 8, led the boys. Evans won three events, finished second, had three best times and led off SOFLO’s second-place 100-yard freestyle relay. Evans won the 25-yard butterfly in a best time 24.33; 25-yard backstroke in 26.91; 25-yard breaststroke in a best time 27.27; and second in the 25-yard freestyle in a best time 22.97. Evans was joined by Caitlin Nguyen, Isabella Perry and Francesca Perry on the 100-yard freestyle relay that finished second in 1:17.00. Jimenez swept all four sprint events and had two best times. He won the 25-yard butterfly in 23.45, 25-yard backstroke in a best time 19.63, 25-yard breaststroke in a best time 23.45 and 25-yard freestyle in 17.20. Caitlin Nguyen, 8, Isabella Perry, 8, Francesca Perry, 7, Saree Young, 8, and Aanya Robinson, 7, all made their sizzler debut and swam well. 6-and-under, 1. Jordan Evans, SOFLO 24.33, time drop; 7-8, 1. Daryna Karachum, YSF 18.35. 6-and-under, 1. Jordan Evans, SOFLO 26.91; 7-8, 1. Daryna Karachum, YSF 19.54; SOFLO: 3. Caitlyn Nguyen, 20.87, 4. Isabella Perry 21.33, 5. Shelby Evans 21.37, time drop, 7. Francesca Perry 22.63, 11. Saree Young 24.39, 13. Aanya Robinson 26.02. 6-and-under, 1. Jordan Evans, SOFLO 27.27, time drop; 7-8, 1. Daryna Karachu, YSF 21.52; SOFLO: 2. Shelby Evans 22.20, time drop, 3. Caitlyn Nguyen 24.31, 4. Isabella Perry 25.13, 8. Francesca Perry 27.29, 9. Aanya Robinson 27.83, 11. Saree Young 28.17. 6-and-under, 1. Cherill Royalty, YSF 19.13; SOFLO: 2. Jordan Evans 22.97, time drop; 7-8, 1. Ava Wolfe, YSF 16.84; SOFLO: 3. Isabella Perry 17.46, 4. Caitlin Nguyen 17.82, 6. Shelby Evans 19.02, time drop, 10. Francesca Perry 20.58, 12. Saree Young 21.18, 13. Aanya Robinson 22.32. 8-and-under, 1. YSF 1:13.44. 2. SOFLO 1:17.00 (Jordan Evans, Caitlin Nguyen, Isabella Perry, Francesca Perry). 6-and-under, 1. Daniel Gil-Restrepo, CSSC 24.33; 7-8, 1. Connor Jimenez, SOFLO 23.45; SOFLO: 7. Preston Christensen 30.39, time drop. 6-and-under, 1. Daniel Gil-Restrepo, CSSC 25.61; 7-8, 1. Connor Jimenez, SOFLO 19.63, time drop; SOFLO: 2. Preston Christensen 23.47, time drop. 6-and-under, 1. Guillermo Mantilla, YSF 28.18; 7-8, 1. Connor Jimenez, SOFLO 23.45, time drop; SOFLO: 7. Preston Christensen 30.39, time drop. 6-and-under, 1. Daniel Gil-Restrepo, CSSC 20.86; 7-8, 1. Connor Jimenez, SOFLO 17.20; SOFLO: 5. Preston Christensen 20.67, time drop. 8-and-under, 1. Pine Crest 1:26.38. PLANTATION, February 9, 2018–South Florida Aquatic Club had six swimmers among the Top 11 finishers in the mixed 800-meter freestyle Friday night at the Florida Gold Coast Senior Long Course Sectional Qualifier at Plantation Aquatic Complex. Rafael Rodriguez, 16, was SOFLO’s top finisher placing third in 8:52.18. Andres Lares, 18, of Azura won the event in 8:47.93. SOFLO teammate Kathleen Golding, 17, was the top overall girls finisher placing fourth in 9:16.69. Four SOFLO Top 11 turned in best times. Joseph Lee, 15, was sixth in a best time 9:19.38. Mallory Schleicher, 14, was eighth overall and second girl finisher in a best time 9:27.32. One of the Florida Gold Coast’s top open water swimmer’s previous best was 9:46.96. Bryan Rivero, 16, was tenth overall and finished in a best time 9:30.83. Nicolas Rossi, 14, was 11th in a best time 9:32.14. SOFLO teammate Ricardo Roche scratched from the event because of illness. Thirty-one boys and girls swimmers were in the 800 field of the opening event. In addition to SOFLO, among the 24-teams competing are Azura, Pine Crest, Swim Fort Lauderdale, AquaKids Sharks, East Coast Aquatic and Boca Raton Swim Team. SOFLO leads after opening day action with 43 points in the boys category and 26 in the girls category. The two-day meet concludes on Saturday with two sessions at 9 a.m. and 5 p.m. GIRLS TEAM TOTALS: 1. South Florida Aquatic Club 26, 2. AquaKids Sharks 9, 3. St. Thomas Swimming Association 3. BOYS TEAM TOTALS: 1. South Florida Aquatic Club 43, 2. Azura Florida Aquatics 20, 3. Sunrise Swimming 14, 4. AquaKids Sharks 12, 5. Pine Crest Swimming 4, 6. Plantation Swim Team 2; Unattached-06, 22. 1. Andres Lares, Azura 8:47.92, 2. Miguel Cancel, Unattached 8:48.14, time drop, 3. Rafael Rodriguez, SOFLO 8:52.18, 4. Kathleen Golding, SOFLO 9:16.69, 5. Patrick Doyle, Sunrise 9:17.66, 6. Joseph Lee, SOFLO 9:19.38, time drop, 7. Dominic Bono, AquaKids Sharks 9:22.39, 8. Mallory Schleicher, SOFLO 9:27.32, 9. Mary Smutny, AquaKids Sharks 9:30.14, 10. Bryan Rivero, SOFLO 9:30.83, time drop, 11. Nicolas Rossi, SOFLO 9:32.14, time drop, 12. Dante Padron, Unattached 9:38.91; SOFLO; 16. Luis Villanueva 9:43.78, time drop. Schedule: Saturday, Session II, 9 a.m., Session III, 4 p.m.
Where: Plantation Aquatic Complex, 9151 NW Second Street, Plantation.